Posted on April 16, 2019 by William A. Great for a vast variety of decor styles, a glass coffee table can help weave together the final pieces of any living room design. But which one is right for your home? 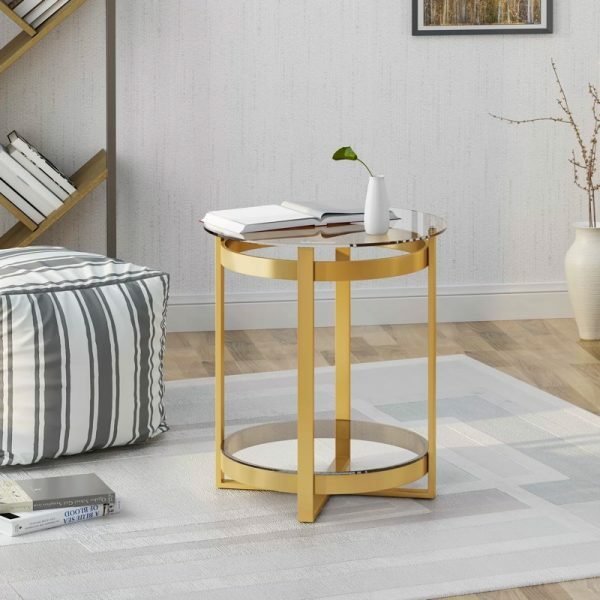 Does your space need an all glass coffee table that helps maintain a sense of spaciousness or maybe it craves a bold glass and gold coffee table that will instantly steal the spotlight? Either way, our list has you covered! 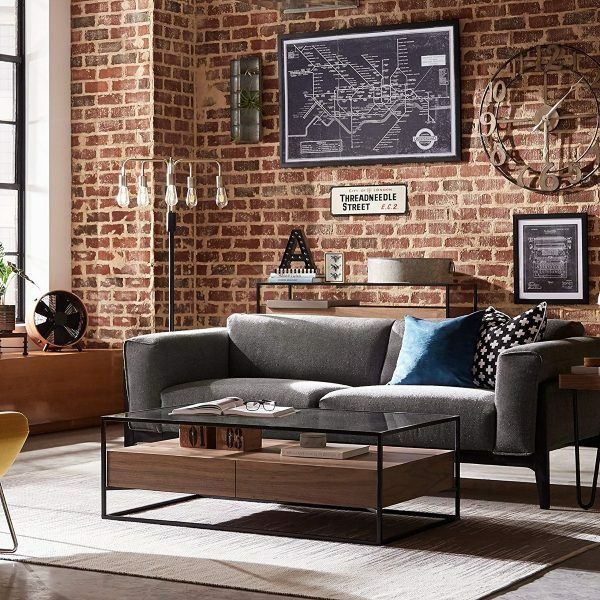 With everything from farmhouse chic to simplistically elegant, you are sure to find the perfect fit for you living room. By integrating the right glass coffee table, not only will you always have a place to rest a cuppa joe, but your interior design will look more professional than ever. 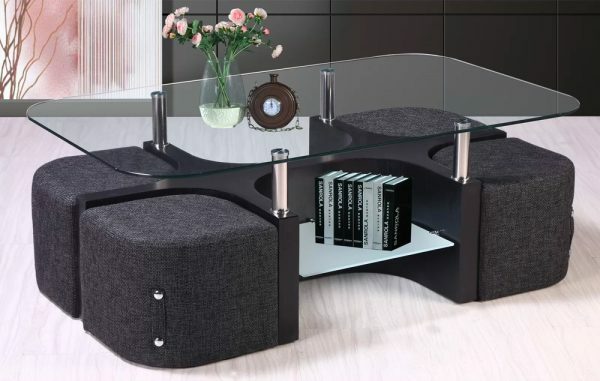 Curved Rectangular All Glass Coffee Table: The coffee table that you need if you are looking for elegance and practicality that won’t overwhelm your living room. This 3 sided glass table has a light and airy aesthetic that will leave the room feeling spacious and won’t detract from your other decor. 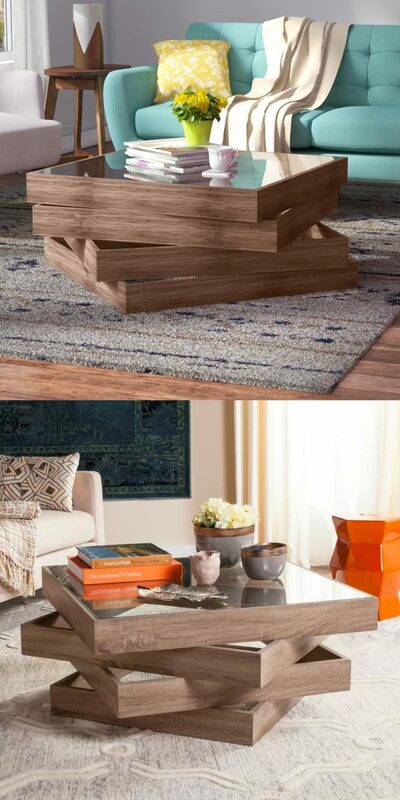 Nesting All Glass Coffee Tables: Space conscious, practical, and stylish, these nesting coffee tables have it all. This all glass option is great for hosting with its 3 pieces can easily be moved to hold food or beverages. 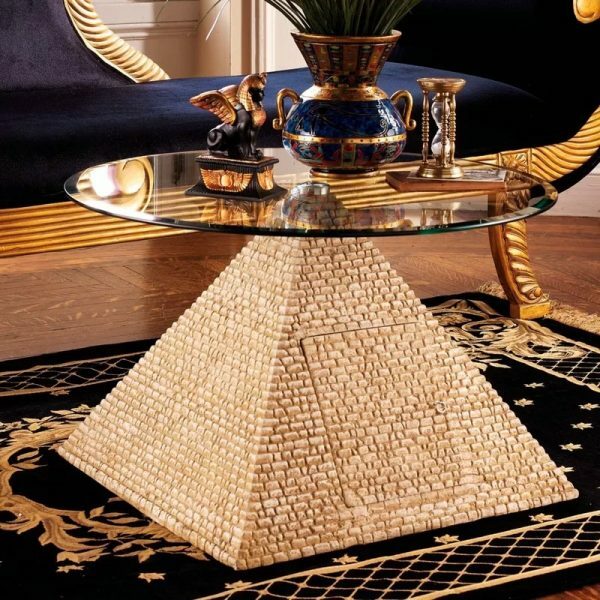 Round Glass Coffee Table: A round coffee table infused with a pop of extra glam thanks to its sleek gold frame. This glass and metal beauty is finished on all sides, so it will look fierce from any angle. 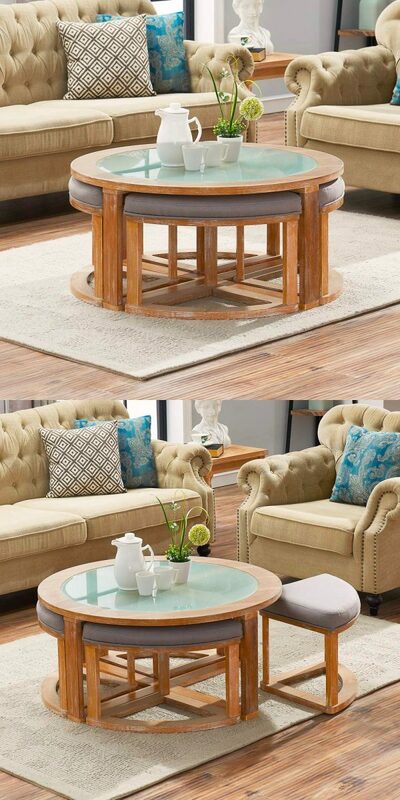 Round Glass And Wood Coffee Table With Nested Stools: A traditional round coffee table with a boost of extra seating. With 4 wedge seats that effortlessly tuck under the round wood and frosted glass table, you never have to worry about being short on seating again. 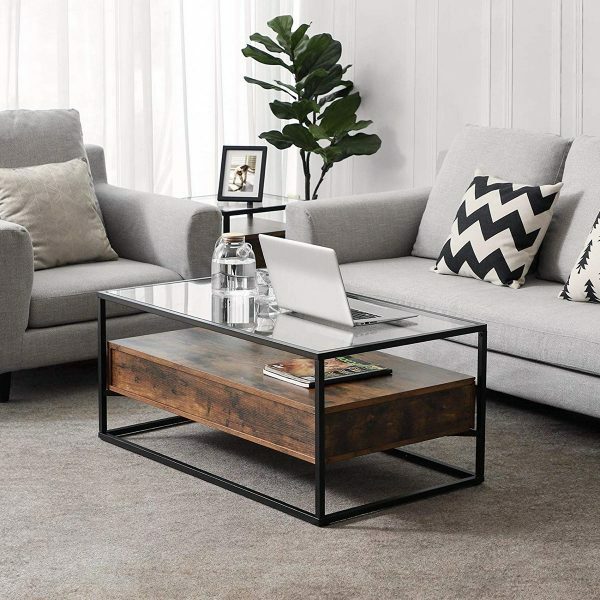 Rounded Rectangular Glass Coffee Table With Nesting Stools: If you love the idea of tuck away seating, but are looking for an option with more modern appeal, then this table is a fabulous find. Not only does it have nesting stools, but it also has extra storage thanks to its stylish bottom shelf. 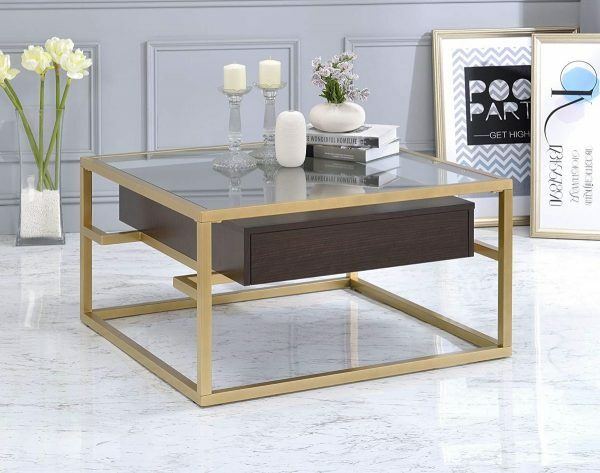 Rectangular Glass Top Coffee Table With Gold Base: Because we’re all about that base! 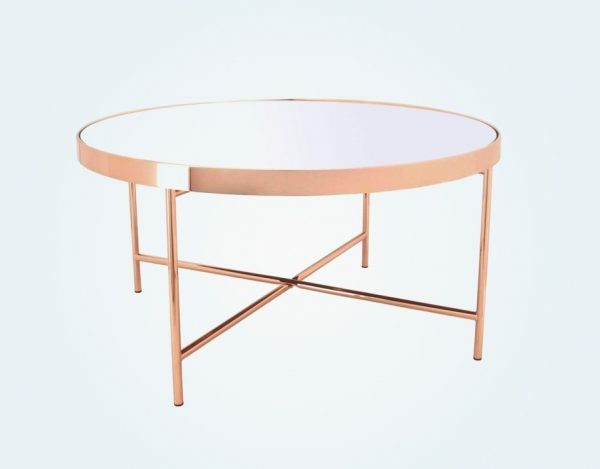 This glass top table with its gold base caught our eye with its unusual shape and brushed metallic finish. Also available in Silver. 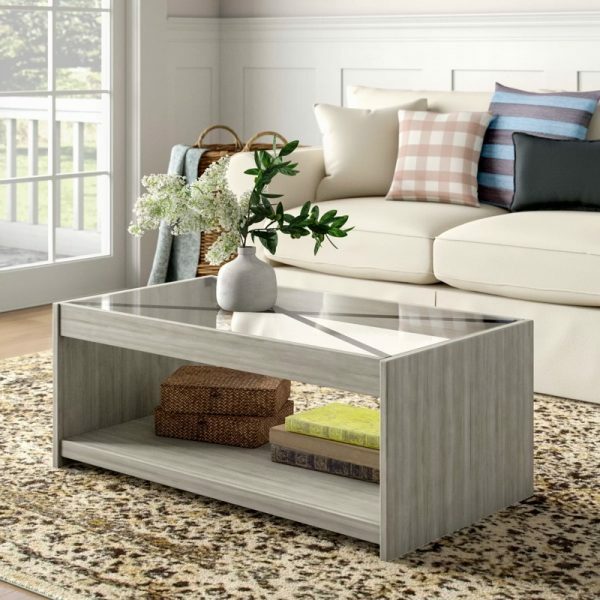 Square Glass Coffee Table With Storage Drawer: Keep the clutter off your coffee table and out of sight with this glass option that uniquely includes a storage drawer. A bold choice that will make a big impact in any living room. 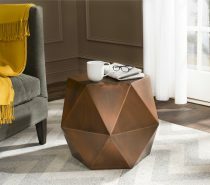 Small Glass Coffee Tables With Geometric Brass Base: Infuse your living room with the modern style that only geometric design can provide. 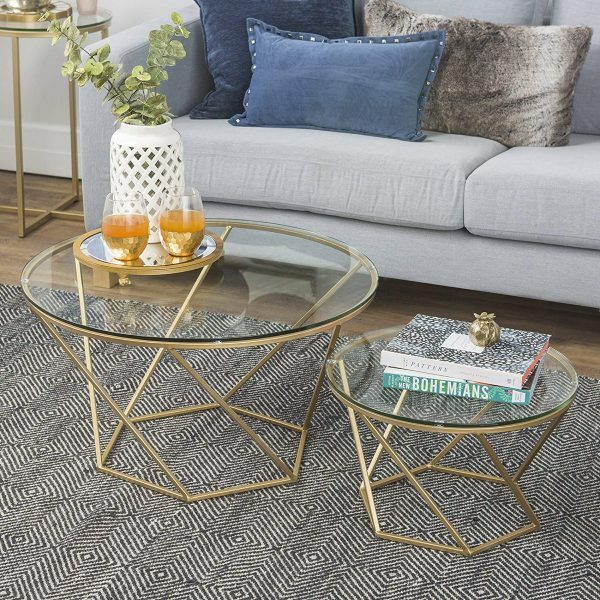 The combo of the gently curved glass and hard angles of the brass base make these coffee tables quite the jaw dropper. 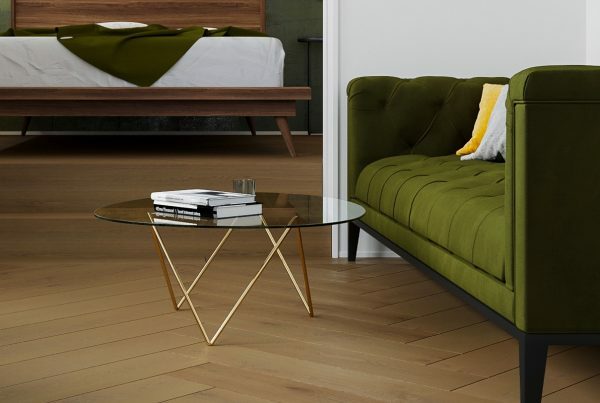 Tiny Golden Glass Coffee Table: The best things come in small packages! This tiny table may be small in size, but it still has mega style with its double tier design and gold base. Too small for your coffee table taste? This also makes for a unique end table. 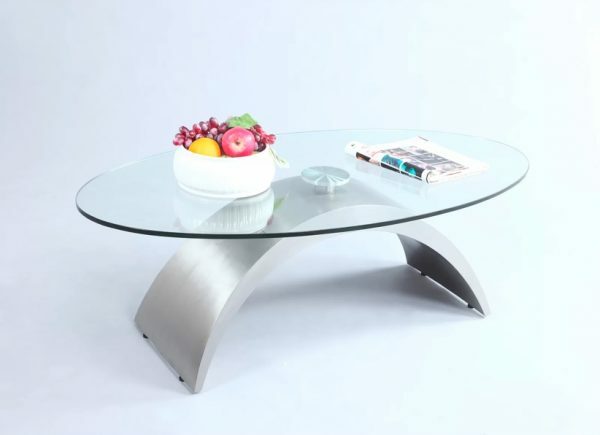 Silver And Glass Coffee Table: The gentle curve of the metal base perfectly compliments the oval top of this modern coffee table. 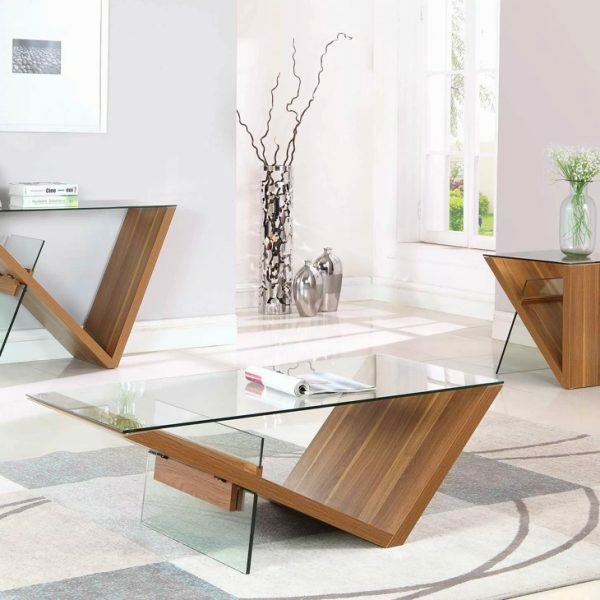 It’s a fantastic piece of metal and glass furniture to style any contemporary living room. 3 Piece Glass Coffee Table Set: For those who love the ease and flow that a matching coffee table and end tables can create, these are for you! With their unusual metal base, these are perfect for any modern or contemporary home. Copper Coffee Table with Mirror Top: A large Mid-Century / Scandinavian coffee table that is elegant and glamorous. It has even been fitted with a mirror top for an extra dose of high shine appeal. 3 Piece Wrought Iron Coffee Table With Glass Top: Another matching coffee table set, but this time with the added benefit of a sturdy wrought iron frame. A great set for either traditional or transitional homes. 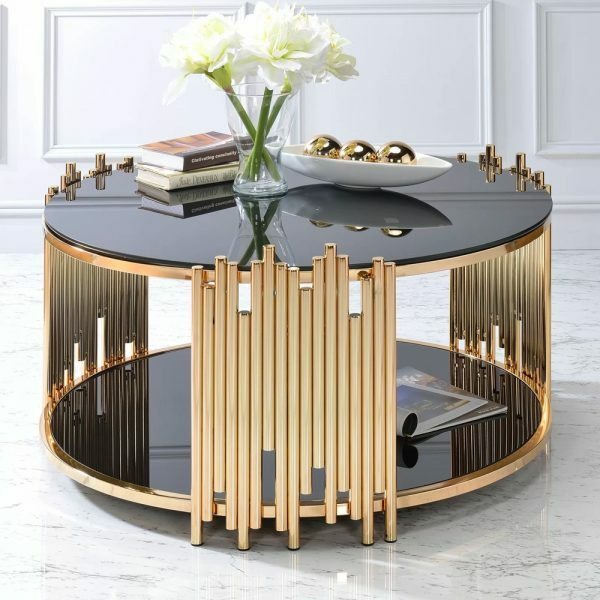 Brass & Smoked Glass Coffee Table: The eye catching design of this smoke glass coffee table will have people thinking you paid top dollar for such an incredible find. An affordable table that is easy on the eyes and on your wallet. Modern Silver Square Coffee Table: Jenga, anyone? Alright, so disassembling this table would be a design crime, but so would not cashing in on this silver beauty’s unique aesthetic. A showstopper for any living room. 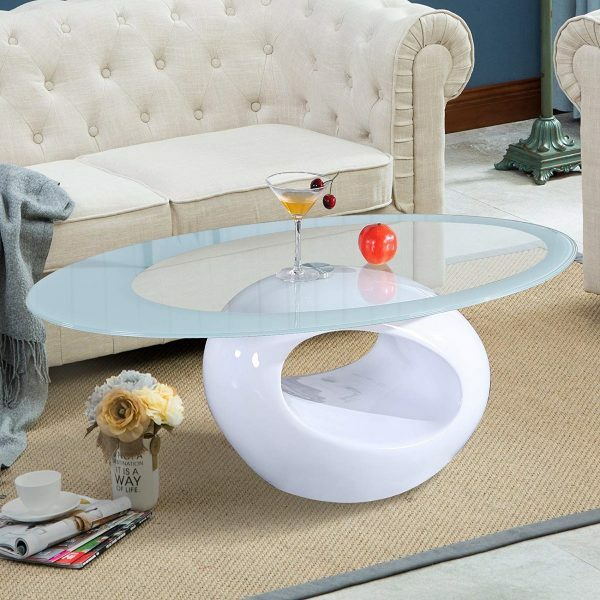 Oval Glass Coffee Table With White Base: Simple, yet intricate, this oval coffee table makes quite the statement with its unusual white base. A perfect balance of curves that may be just what your living room needs! Mermaid Coffee Table: Look at this table, isn’t it neat? We think it would make your living room complete. A great piece of mermaid home decor for any space. 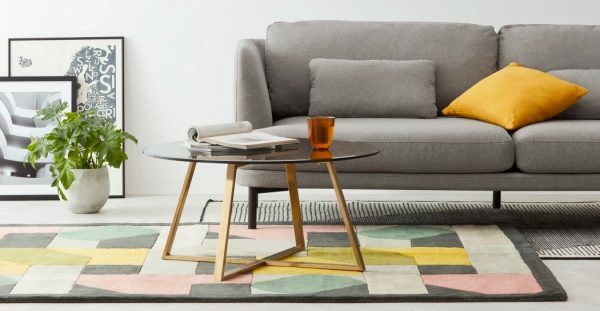 Minimalist Glass Coffee Table With Triangular Wooden Base: A minimalist glass coffee table that really knows how to flaunt what it’s got with its triangular wood base. A matching console table and end table are also available. 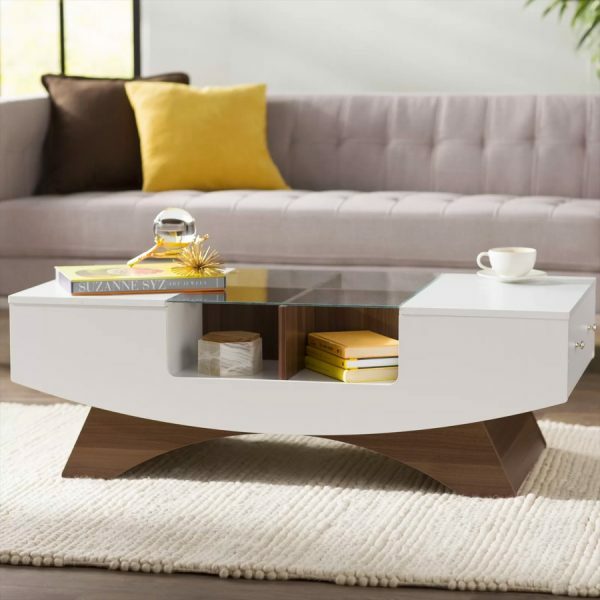 Minimalist Rectangular Glass Coffee Table With Wooden Shelf: The glass and wood combo of this coffee table is extra dynamic with a chunky wood shelf that is made to appear as though it is floating. The ideal mix of style and function in a table that is both affordable and attention grabbing. Modern Industrial Style Glass Coffee Table: This floating coffee table is a modern industrial gem. Equipped with a wood veneer shelf that is superior at highlighting select accessories. Rustic Industrial Glass Coffee Table: A rustic coffee table that is aching to be incorporated into industrial or farmhouse decor. The combo of the warm wood finish, metal frame, and glass top give this piece an aesthetic that is a mix of cozy and edgy. Low Glass Top Round Coffee Table: This round coffee table with its unusual base instantly caught our eye. Ideal for living rooms with low furnishings. Available in Off White, White Gloss, or Black Gloss (shown). 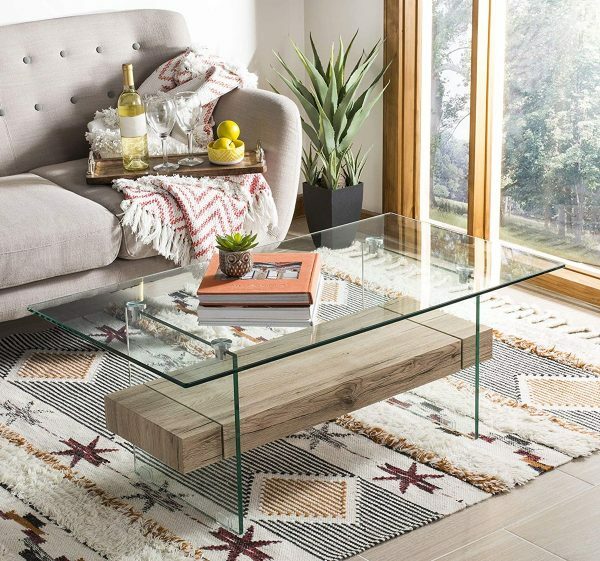 Modern Farmhouse Style Coffee Table With Glass Top: This farmhouse style coffee table features modern style and an easy clean glass top. Available in Brown, Gray, or White (shown). 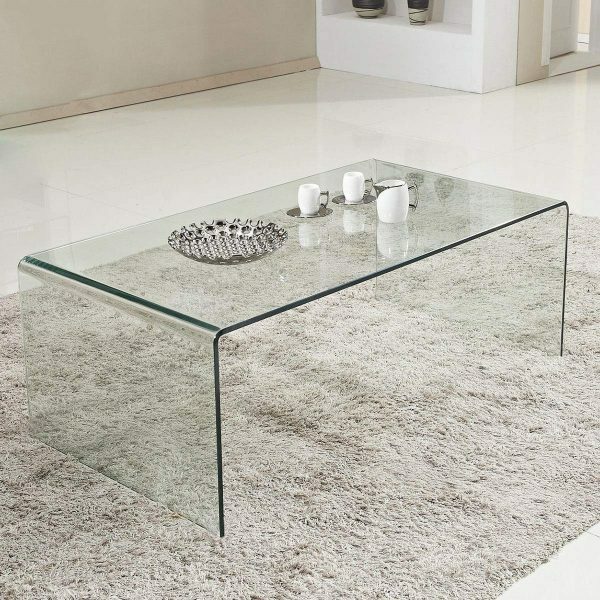 Rectangular Swiveling Glass Top Coffee Table: This swiveling coffee table is sure to be the talk of the party. After all, it’s like having a giant Lazy Susan right in your living room! 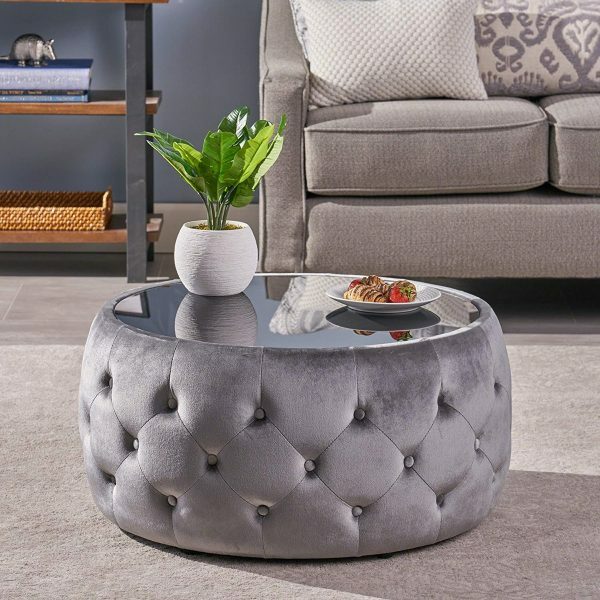 Round Swiveling Glass Top Coffee Table: This swiveling glass coffee table will look great at any angle with its edgy, solid wood base. A fantastic way to create a focal point in any living room. 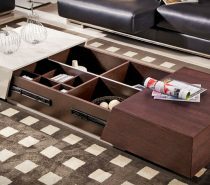 Stylish Modern Wood & Glass Coffee Table With Storage Drawers: The pop of deep brown on this clean white coffee table is great, but then again, what isn’t? 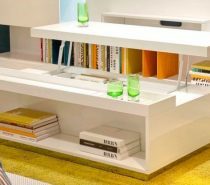 This modern piece features side storage, a middle shelf, and ample table top space. Also available in a dark Espresso. White Glass & Wood Coffee Table: This white and wood coffee table gives off a Mid-Century Modern vibe that we just can’t shake. Display your best accessories in the glass top shelving or hide away your clutter in one of the side drawers. This coffee table has thought of it all. Also available in Black. 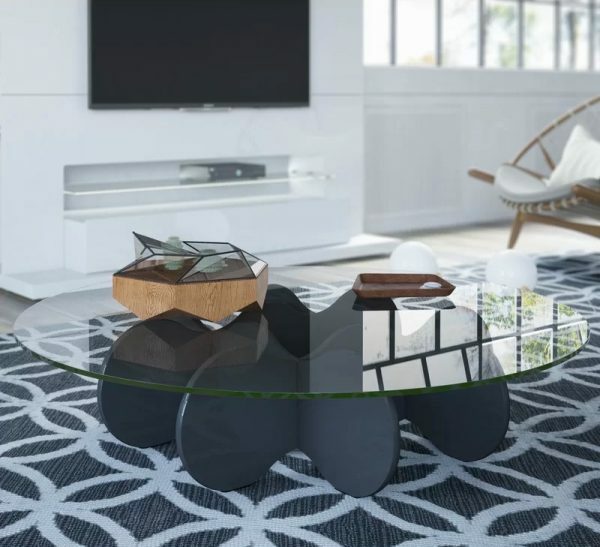 Modern Black Glass Coffee Table: A modern black coffee table that would do any contemporary home proud. The soft edges of this piece balance out the punch of contrast it will add to any light room. 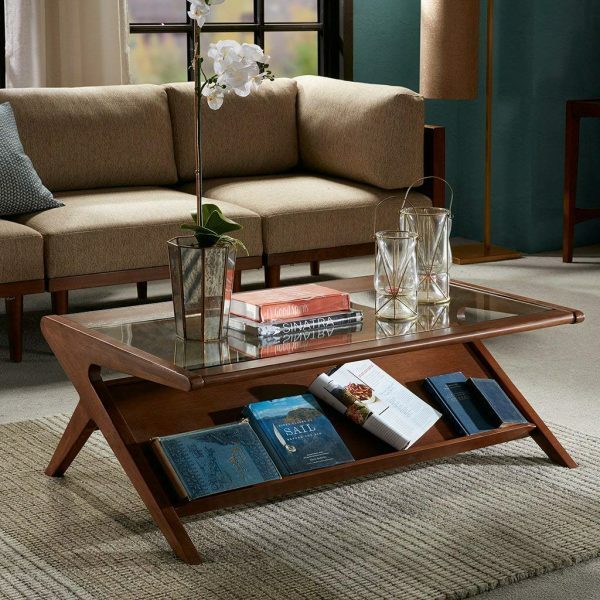 Glass & Wood Coffee Table With Magazine Display Shelf: Finally, an organized way to have all your favorite reads on hand from the comfort of your couch. A dream for book lovers and magazine readers alike, this glass and wood coffee table is a fantastic choice. 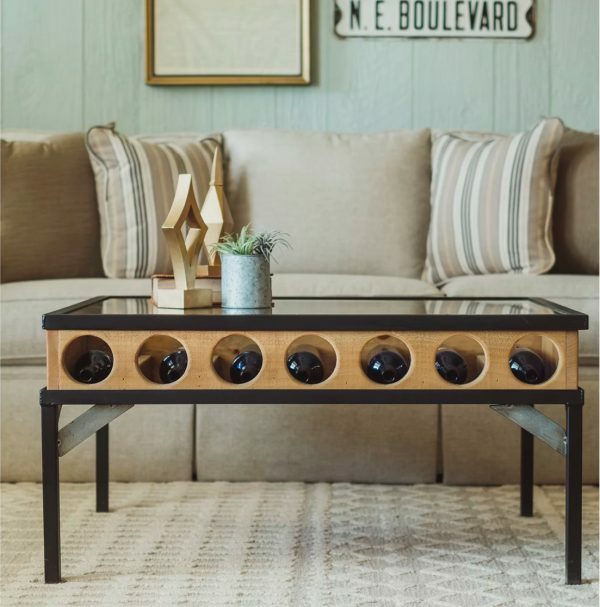 Glass Wood And Steel Coffee Table With Bottle Display: Calling all wine lovers, we’ve found the coffee table of your dreams! This fun coffee table effortlessly combines the industrial and classic farm look to create a design that is perfect to display your favorite bottles. 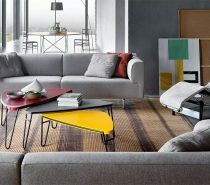 Noguchi Style Coffee Table: It’s not often that we come across a Mid-Century Modern coffee table quite this exquisite! 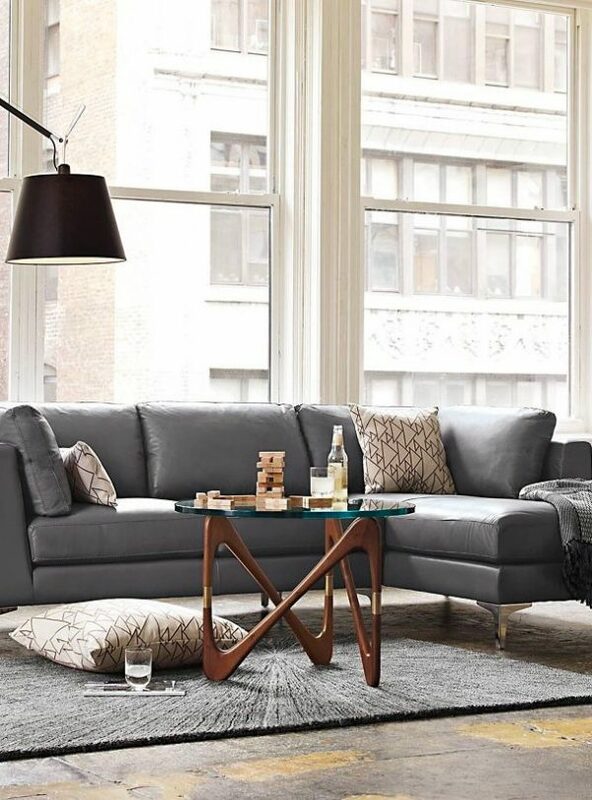 This Noguchi style coffee table is versatile and stylish enough to blend in with almost any decor style. You can also find the original here. Platner Style Coffee Table: A design icon, this Platner style coffee table still looks as fierce as ever. A great way to add a vintage touch to any living space. Looking for a bit more luxury? Find the original Platner coffee table here. 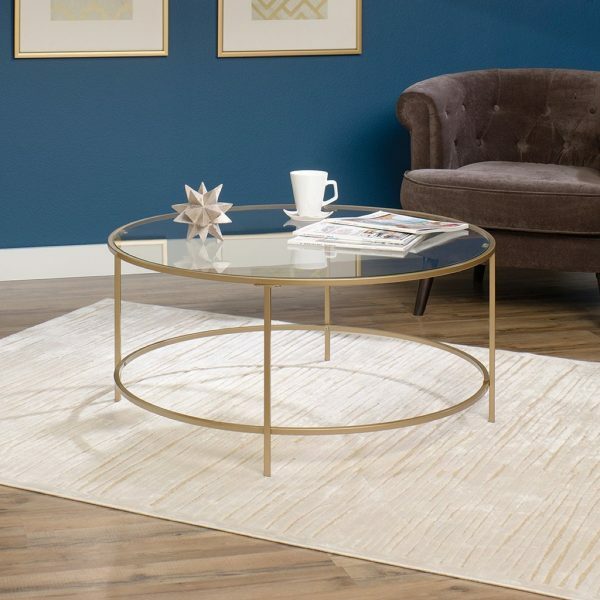 Brass Base Glass Coffee Table: With its dynamic pairing of glass and brass this coffee table is brimming with distinct style and elegance. Love the look, but not the price tag? Here is a cheaper alternative. 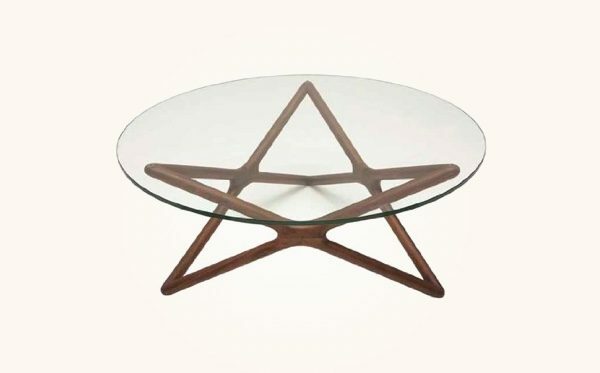 Star Shaped Coffee Table: Help your coffee table reach its full, superstar potential with this star shaped coffee table. An impeccably balanced piece that melds well with many decor styles. Moebius Table: The smooth flow of the base makes the Moebius table an elegant choice with a playful edge. A beautiful pairing of richly stained, solid walnut and thick, quality glass. 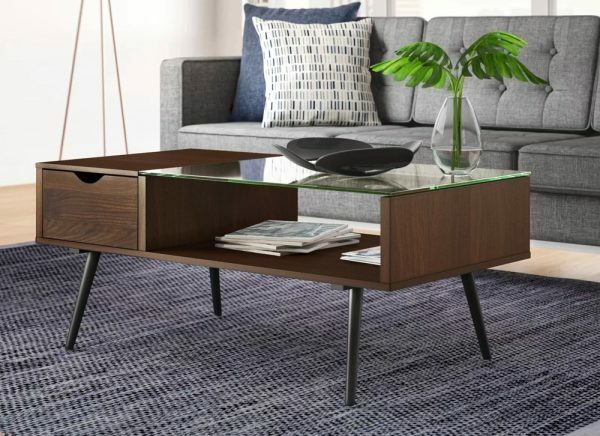 Mid Century Modern Style Wood And Glass Coffee Table: If you are looking to add some Mid Century Modern style to your home, then this coffee table can definitely help! 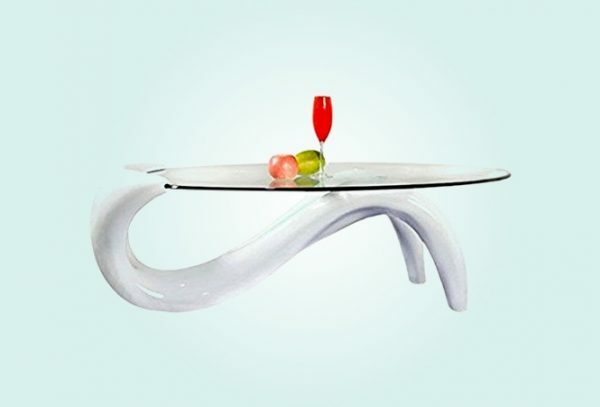 A table that will give your living room an extra boost of charm. Circular Glass Coffee Table With Sphere Base: A fun and quirky coffee table that is neutral enough to fit into almost any living room. An easy way to infuse your space with some unexpected flair. Also available with a white base. 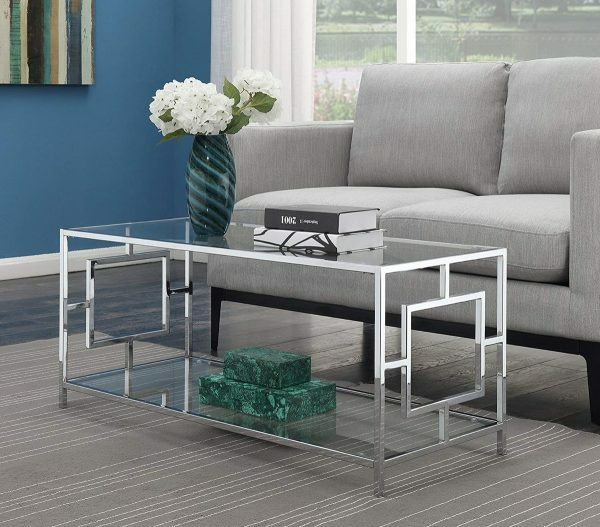 Chrome And Glass Coffee Table: A high shine coffee table that is oozing with modern style. The chrome provides the durability that a coffee table needs, while the sleek finish gives it the look that a contemporary homes crave. Also available with black glass. 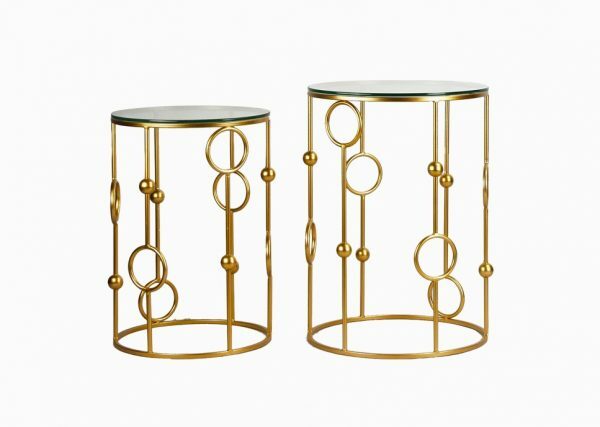 Art Deco Style Glass Coffee Tables: This two piece coffee table set will give off a high fashion look with its Art Deco style. A great idea for smaller spaces as the shorter table can be tucked under the larger one. 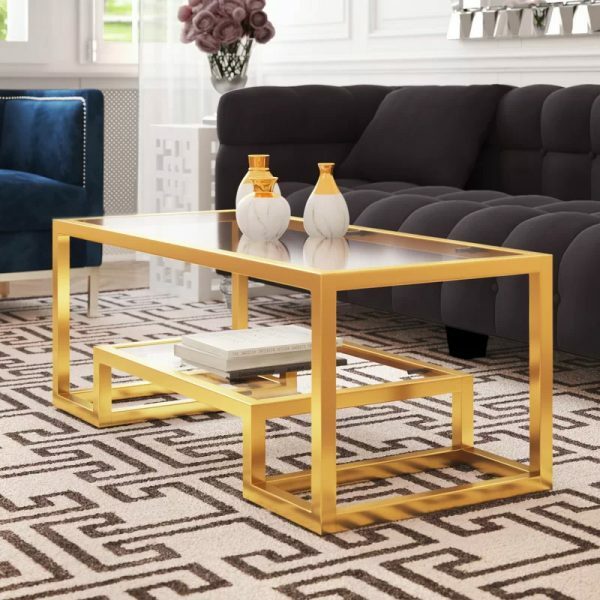 Gold And Glass Coffee Table: The asymmetrical gold tubing and black glass top of this coffee table make it ideal for contemporary spaces. It was even designed with a bottom shelf for a boost of extra storage. Ottoman Coffee Table With Tempered Glass Top: This ottoman has been fitted with a glass top to create one plush looking coffee table. A wonderful choice if you are going for a design that needs to look extra welcoming and cozy. 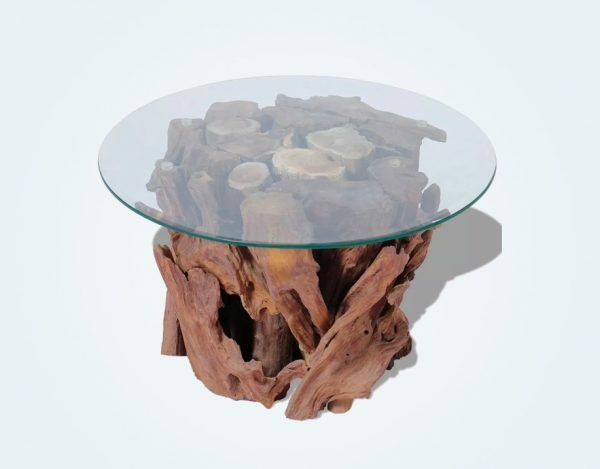 Round Glass Top Coffee Table With Teak Driftwood Base: Bring the feel of nature into your home with a coffee table perched upon an earthy, teak driftwood base. Due to the nature of the wood, no two coffee tables will be alike, leaving you with a piece of furniture that is one-of-a-kind. 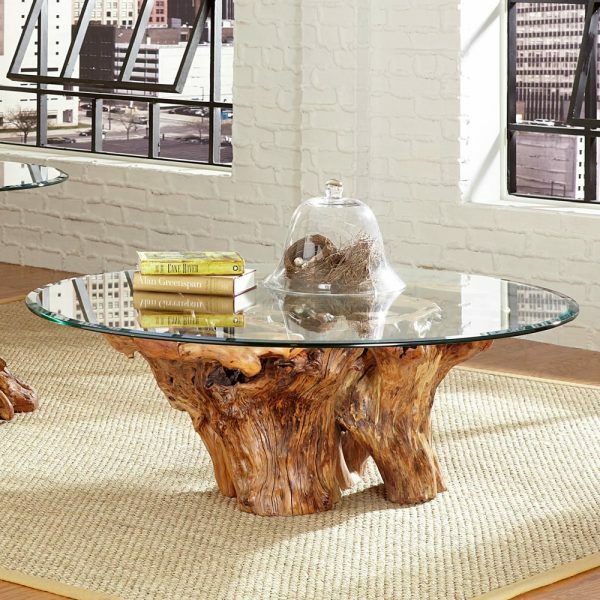 Large Glass Top Coffee Table With Driftwood Base: The delicate aesthetic of the glass top is balanced perfectly by the solid driftwood base on this coffee table. A beautiful way to integrate a hint of organic design or nature in any space. 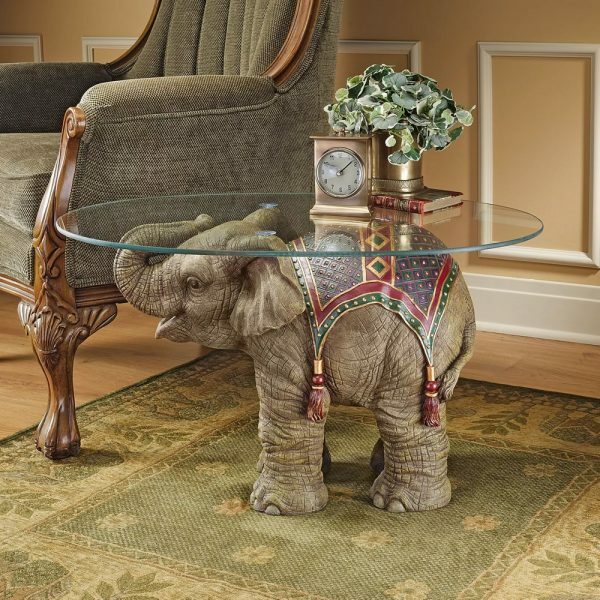 Glass Coffee Table With Elephant Base: Elephant lovers rejoice! We found a highly eye catching coffee table for your living room. Part art and part table, this could be the perfect addition to your elephant decor. Dragon Coffee Table: Fierce even while holding a bowl of grapes, this is one piece of dragon decor that you don’t want to miss. 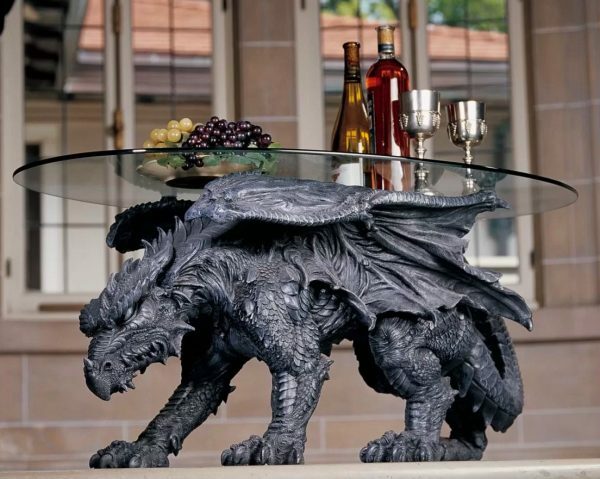 This dragon coffee table would be a fun addition to a game room or a Game of Thrones home decor scheme. Terrarium Display Coffee Table: Make your coffee table pull double duty with this terrarium display that will showcase low light plants in a way that is sure to wow. This is a great option for pet owners with plant munching fur babies. 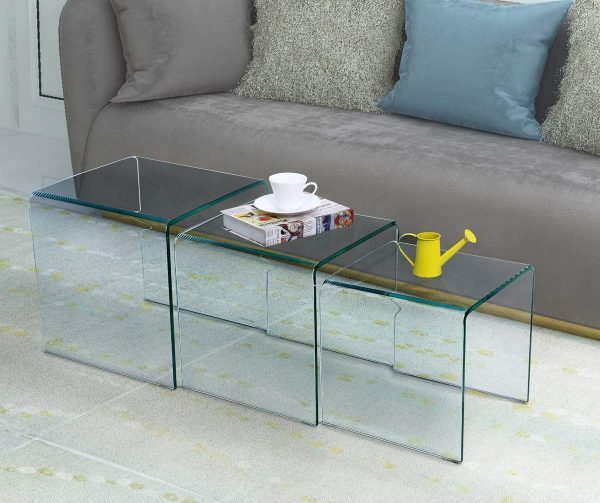 Square Glass Aquarium Coffee Table: If you love your decor to be offbeat, then this is a definite contender! 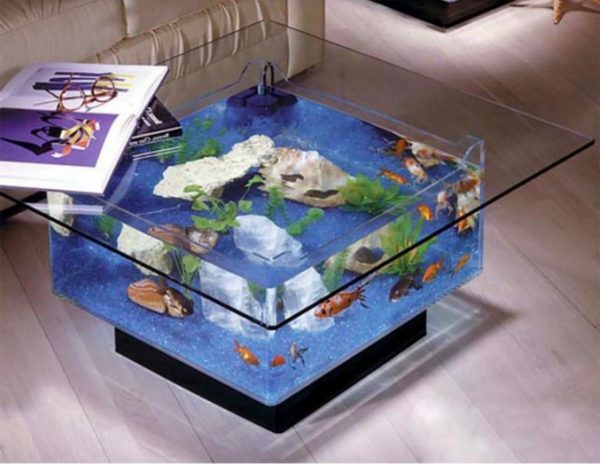 This aquarium coffee table makes for a stunning display when filled with a few fish friends and other aquatic life. 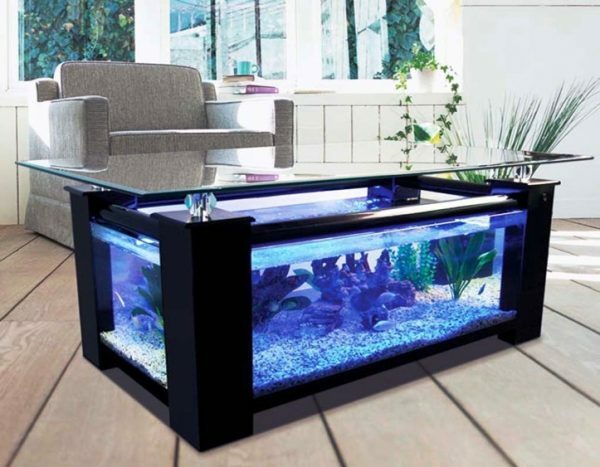 Rectangular Aquarium Coffee Table: Another aquarium coffee table, but with a whole lot of extra room. 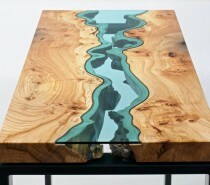 A unique way to integrate the wow factor into any living space. 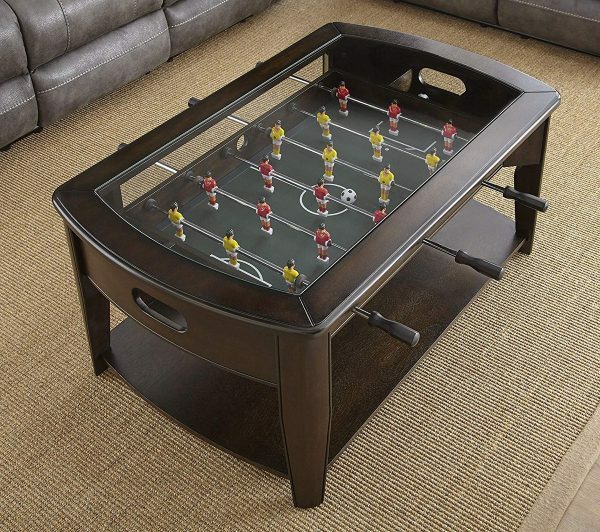 Foosball Coffee Table: A fun coffee table option with a touch of class. Now you can concentrate on your R&R and brush up on your foosball skills. 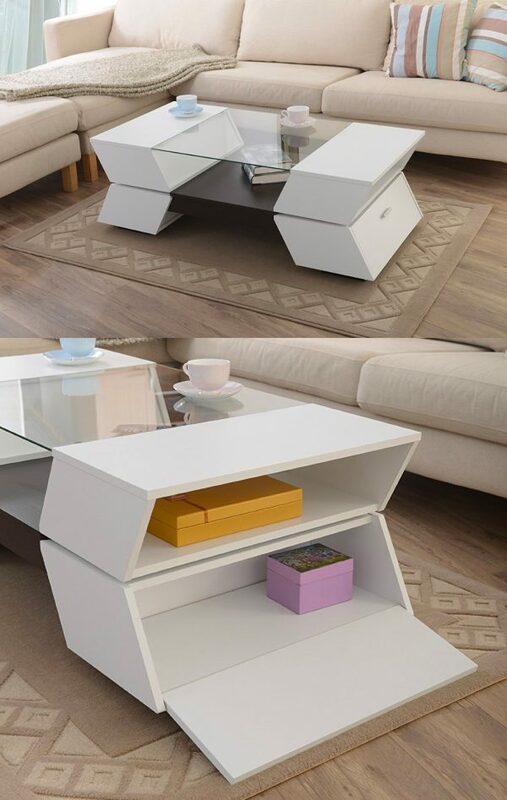 Fridge, Speaker And Phone Charging Glass Top Coffee Table: For when you need the whole kit and caboodle, this coffee table is a must. It features a large speaker, a fridge, outlets, and even a phone charging glass top! A great piece of technology that is sure to make any living room an absolute joy. Next Post Wanna See Some Finished Bedrooms & Bathrooms at The Duplex?